Have you noticed that in the last 10 years there has been a dramatic change in web sites. Back then you paid big dollars for the most basic of web sites and today well you can whip up a web site literally within minutes complete with video, colour graphics and start driving traffic without spending a dollar. Of course I am not saying that we should all dump our web designer and DIY. What I am saying that you can be a lot more effective in your online experience for a smaller cash outlay. There are a lot of resources available today that once were a twinkle in somebody’s eye. Here we will describe here about FREE contact forms. A contact form is an integral part of many websites since it saves a lot of time and makes it extremely easy for site visitors to contact you directly. Still, creating website contact forms is sometimes a very tedious work if you don’t have the right tools and are not familiar with PHP programming. This hurdle can be easily overcome with the help of online form generators which will help you design your own contact form and, by putting a script, embed this professionally looking form anywhere in your website. There are many free options from which you can create a contact form for your website. The services usually offer both free service plans with less features and the paid ones which will remove the limitations and offer extra features. In this round-up, you’ll find the range of 15 free contact form services that allow you to create contact forms easily even without knowing much about PHP programming. Note that some of them may additionally have advanced premium options that actually require a monthly fee. Now please, go through this quick review of the main free contact form creators. Let us know your opinions of those in case you’ve had a chance to work with some of them before. 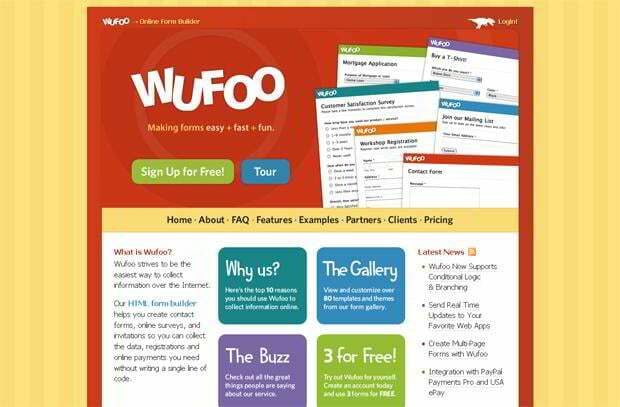 WuFoo HTML form builder not only helps you create free contact forms, but also online surveys and invitations so you can collect the data, registrations and online payments you need without having to fuss with a single line of code. When you design a form with WuFoo, it automatically builds the database, back-end, and scripts needed to make it just work. Plus, there are lots of features, including predefined forms, html form templates, Likert scales, Captcha, and there’s no need to worry about any upgrades or server configuration, because they host everything. As for the cons, there are no file uploads and the submissions are limited to 100. Kontactr is a one-click free contact form service which offers highly secure contact form to protect user’s email address. Actually, there’s an image verification system applied (captcha – which is a commong thing about contact forms these days), so that robots cannot submit using the contact form as only humans can recognize the images. Kontactr also provides a variety of tools to embed various forms, buttons, and widgets to be used on the website. 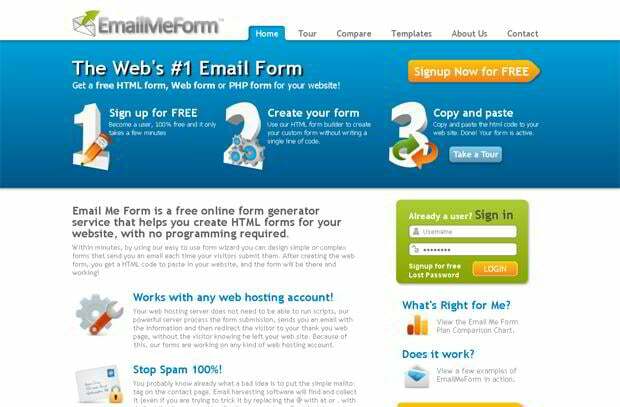 EmailMeForm is a free online form generator service for those who need custom contact forms, web forms or PHP forms for their website. By using their form wizard you can design simple or complex forms that send you an email each time site visitors submit them. Additionally, their forms contain a Captcha image displaying letters and numbers to stop automated submissions. Contact forms from EmailMeForm are working on any kind of web hosting account, and users’ web hosting server does not need to be able to run scripts. 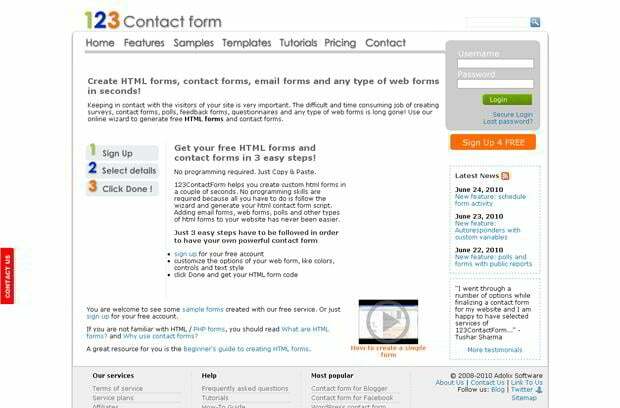 123 Contact Form helps you create custom html forms, contact forms, email forms and any type of web forms. All you have to do is follow the wizard and generate your html contact form script. Besides, you can customize the options of your web form, like colors, controls and text style. Though free 123ContactForm does not offer any file uploads, and their form cannot be used in iFrame, this service provides loads of features, including Captcha, form auto-responder, html form templates, no limit of form submissions. Users who want to create forms with advanced features, like file upload, multiple recipients, data validation etc are required to upgrade their accounts to premium and platinum service plans. 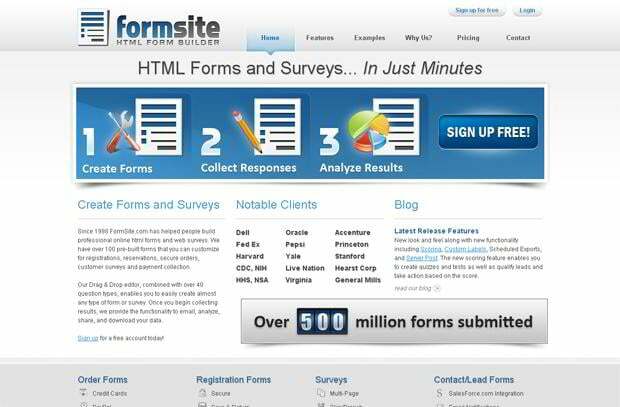 FormSite helps people build professional online html contact forms and web surveys. They have over 100 pre-built forms that you can customize for registrations, reservations, secure orders, customer surveys and payment collection. Their drag and drop editor enables you to easily create almost any type of form or survey. Once you begin collecting results, they provide the functionality to email, analyze, share, and download your data. FormSite’s forms work in all browsers, plus it offers multipage forms, login based secure forms, but is limited to 100 submissions, and Captcha is not available. 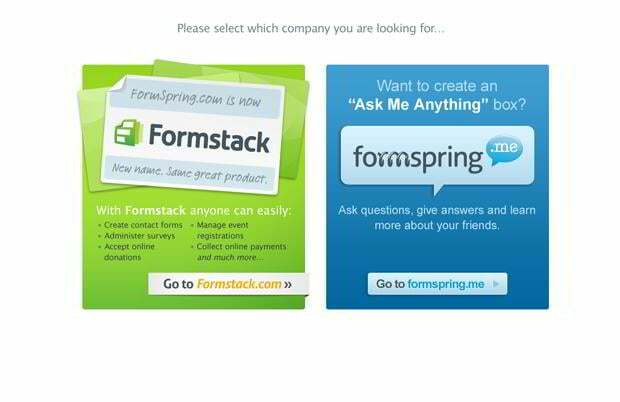 Formspring is a form creator with very limited options for free users, only reason it’s worth trying is that it supports straight redirect of form data to user’s email and no submission monthly limit which is really a very good thing. As for its pros, Formspring has good user interface, includes Likert scales, multi-column layout, reports. Still, it does not provide file uploads and Captcha. Free Contact Form has several versions available, including a free version. If you are looking for a quick no frills website contact form, Lite version is available at no charge. Among the important features Free Contact Form offers, there are unlimited forms and form submissions, full source-code providing, form validation and verification for secure spam protection, support for single line and multiline text fields. 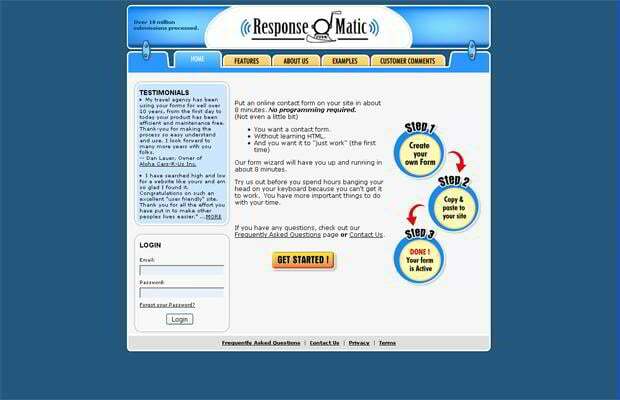 Response-o-Matic offers four different types of plans including the free one. It doesn’t cost anything to get an account to start trying out their service and no credit card is required to sign up. Note that Response-o-Matic does not host the forms for you on their website. They help you create the form with their easy form builder and then give you the HTML code that you must put on your site. 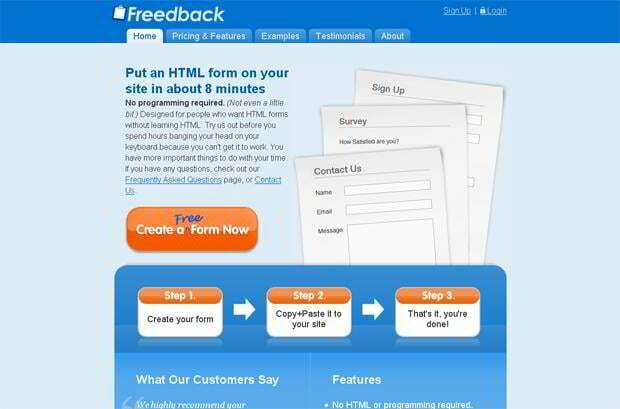 Freedback is designed for people who want HTML forms without learning HTML. With their GUI form builder, you can create your own contact forms being able to instantly receive and automatically respond to form submissions, manage form submissions online using their web interface, and Download form submissions as an Excel spreadsheet. Additionally, there are two ways to use an existing form with Freedback either through fast to setup, but unsupported method (form submissions cannot be exported) or through the “proper” way which supports all Freedback features, but requires more time to setup. 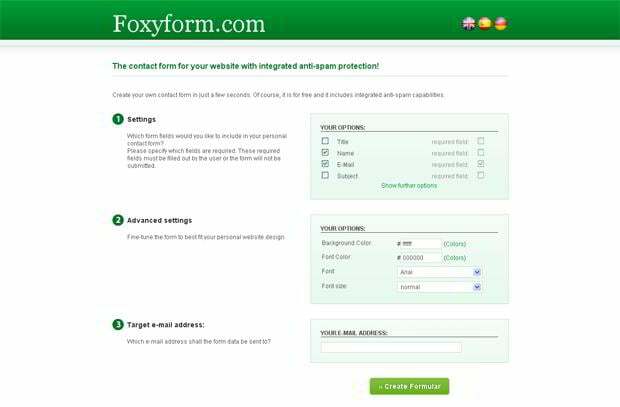 Foxyform is free to create the contact form for your website with integrated anti-spam protection. 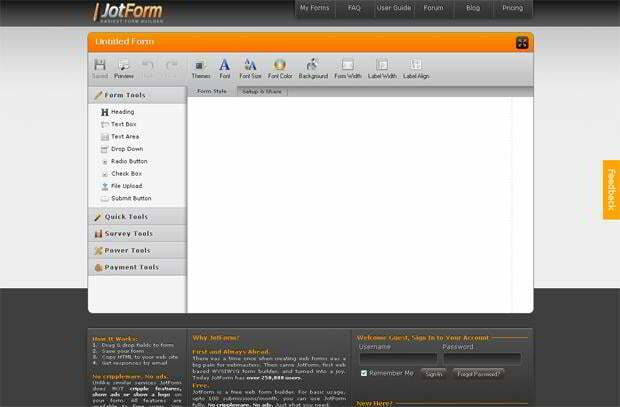 Among advanced settings, Foxyform enables the users to fine-tune the forms to best fit their own website design. Plus, they may specify which form fields they would like to include in their personal contact forms. Contact the Tweet Twins for your social media needs.